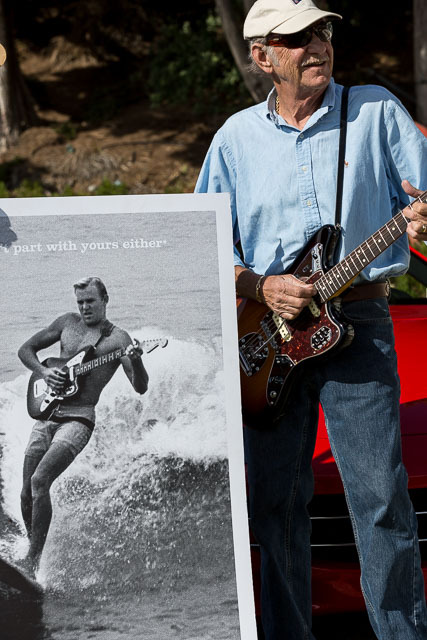 In the early sixties The Challengers were one of the top LA Surf Bands, along with others such as The Beach Boys. Then along came The Beatles and the British invasion which burst the Surf music bubble. Randy Nuart was the bass player for the Challengers, his friend Jon Martin didn’t play in the band but did a promotion for Fender Guitars whereby he surfed while playing a very expensive Fender Jaguar lead guitar. 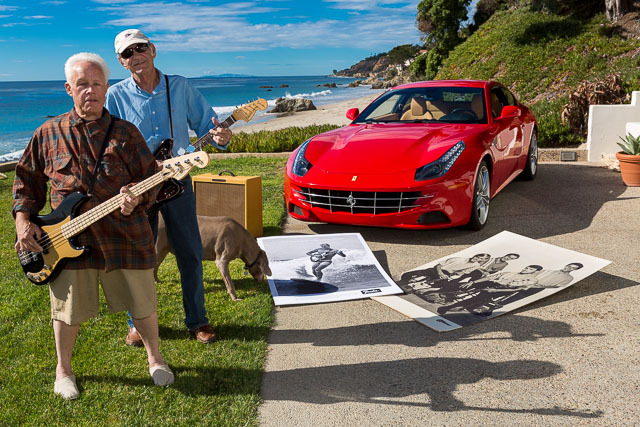 Last Saturday Randy and Jon got together for a “Then and Now” photo shoot and a video interview. We got to take the photos by virtue of the fact that the wife of Jon is a distant cousin of Lorna’s and we stay with them quite often. The Ferrari belongs to Jon. Check out the photos here. Fantastic photography as expected. Great work in getting these guys together. Jon is reliving his life. Got a Ferari again ,the rebuilt Steam launch “Vapor”.I can’t wait to see him doing the Fender Guitar promotion again. I believe he could do it. Happy Thanksgiving to the 2 of you. We are well and have a new motorhome. What fun. From the look of the pictures you seem well and having fun. The pictures are fun. The home owners of TGO are now the “proud” owners of the golf course and restaurant as of last week. Great pix …!!! Great article ..! Looks like a great time was had by all !! I Would have LOVED to have been there with you guys ….